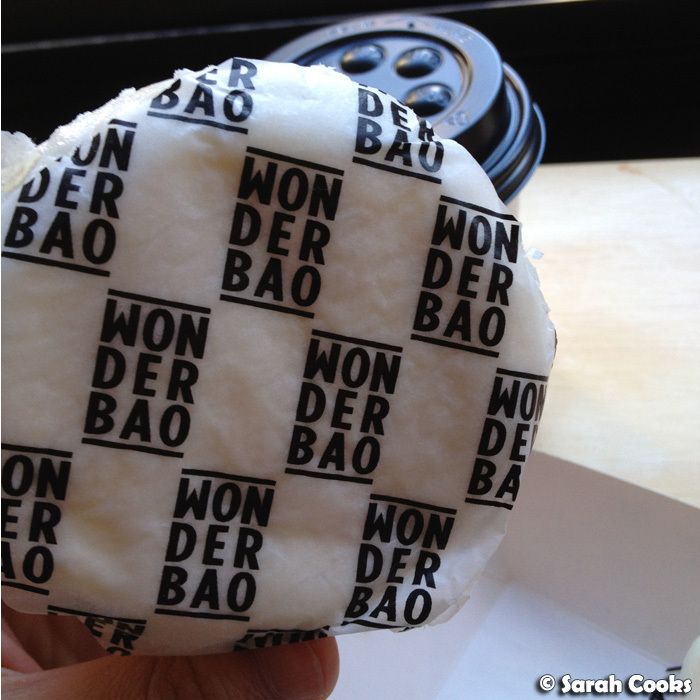 A little while ago I saw some great pics of Wonderbao on Instagram (I'm sarahcooksblog, follow me! ), and thought it would be worth skipping my usual brought-from-home lunches to try it out. It sure was worth it, and I ended up going twice in the one week. Yay! 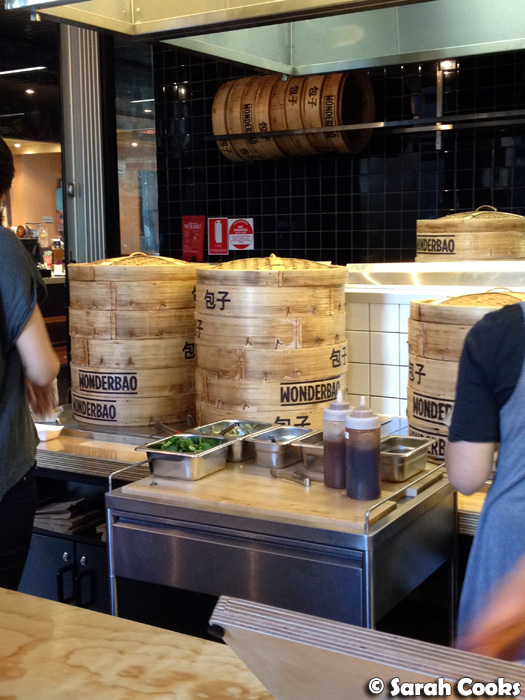 Wonderbao is a new-ish little shop in a laneway near the big green RMIT on Swanston street, specialising in the fluffy goodness that is bao. I really like the concept: there is a short, sharp menu - all bao, all the time. There are five savoury baos (i.e. closed steamed buns with a filling, like the char siew bao you get at yum cha), two sweet baos, and three gua bao (a steamed piece of dough folded around a filling, much like David Chang's pork buns). 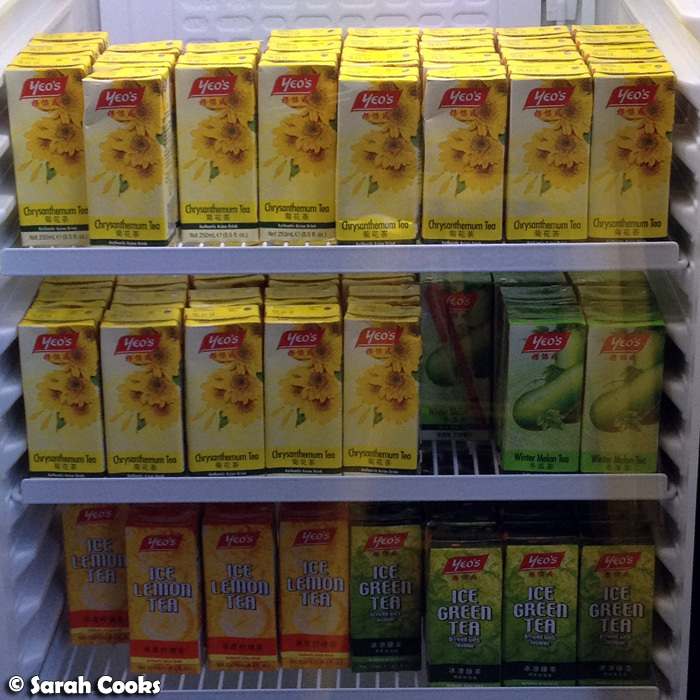 In terms of drinks, they sell the little Yeo's cartons that I grew up drinking, and soy milk (hot or cold). The Yeo's drinks are amusingly referred to as "F.O.B. drinks" on the menu - it's funny that that's cool now. When I was a kid in the 80's/90's, I hated displaying my Asianness. I would have withered up and died if an Aussie kid were to have seen me drinking a Yeo's in the playground, turned up their nose and asked: "aww wot's that?!" Now it's cool to be proud of your heritage and to share it - or perhaps I'm just more self-assured now - either way, I think it is a Very Good Thing. I also thought the process of preparing the soy milk was kinda strange: to serve it, a staff member uses a soup ladle to scoop the soy milk out of the big soup tureen into a little jug, and then pours it through a tea strainer into the little takeaway paper cup - it takes ages and seems a bit cumbersome and difficult in such a small space. Ok, so let's get onto the good stuff: the baos! On my first visit, I had a classic char siew bao (don't worry, I didn't eat it with chopsticks, haha), and a roast pork belly gua bao. I thought the branded bao wrappers were pretty cute! 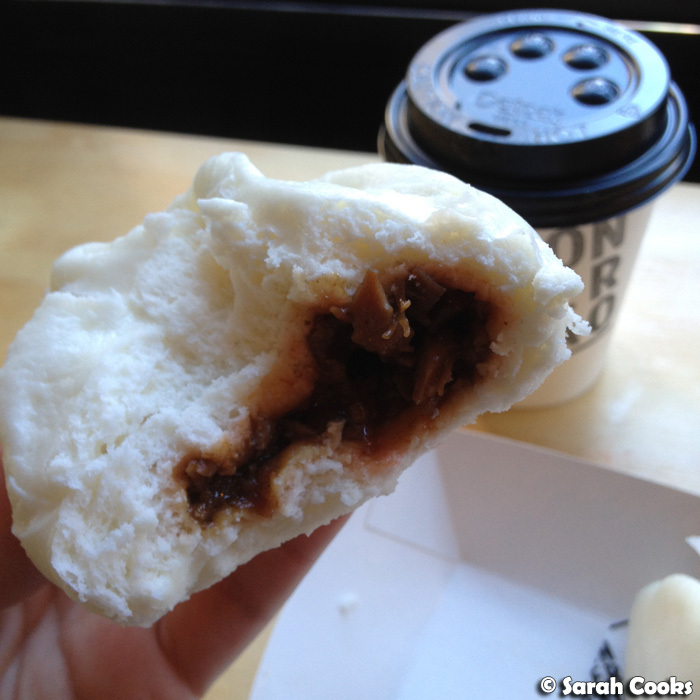 I really liked the char siew bao - the dough was nice and fluffy, and the filling tasted exactly like I expected it to. It was a comforting, well made bao. Although I should add that the friend with whom I visited later in the week commented that they could have been a bit more generous with the filling. (Apparently nearby Nam Loong's char siew bao have a higher filling-to-bun ratio). I was also impressed by the roast pork belly gua bao - it was pretty big (especially compared to Momofuku's pork buns), and had a nice balance of flavours from the fatty pork, the sweet hoisin, and the crunchy veggies. The roast pork itself wasn't crackly like I'd hoped, but I found that I didn't miss it - there was enough texture and flavour going on already. 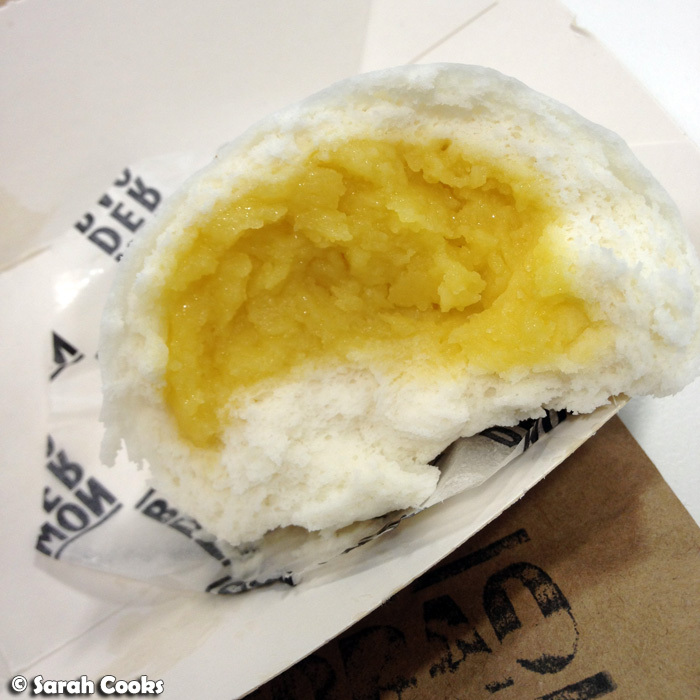 The nai wong bao was very good. Sweet and smooth, with the perfect filling-to-bun ratio. And at only $1.70, you can't really go wrong! On my next visit (two days later), I decided to mix things up a bit, and tried a a chicken bao and a braised pork belly gua bao. The chicken bao was generously filled, with a very firm ball of chicken, mushrooms and egg on the inside. 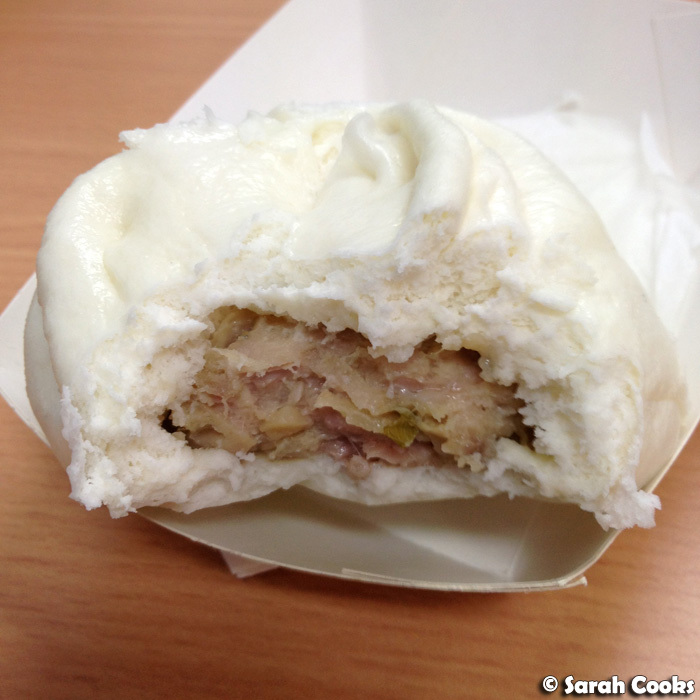 I liked it, but did think that all the other bao/gua baos I tried were even better. 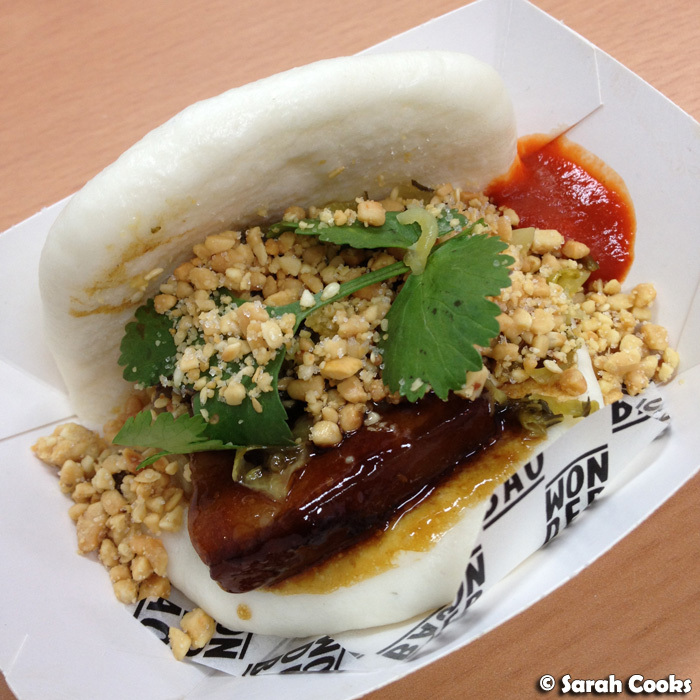 And speaking of which... here's the dee-licious braised pork belly gua bao! I wasn't expecting to like the braised pork belly gua bao as much as the roast pork belly, but it was actually fantastic! The square of pork was tender, with a good balance between meat and fat, and I loved the sticky dark sauce in which it was covered. The crushed, sugared peanuts (like a muah chee coating) were an unexpected, but very tasty addition, and the fresh coriander complimented and cut through the sweetness and richness. So good! I was in the middle of an animated conversation with my friend, and after taking one bite, I do believe I stopped myself and said: "Oh wow, this is really good. Ok, you talk now, I need to eat this!" However, whilst the concept and food are both great, they don't seem to have quite nailed the execution yet and are still finding their feet. The staff, for example, have all been really nice and friendly, but a bit unsure, without the confidence and speed that I'm sure time will bring. Like with that soymilk example I mentioned above, the systems they have in place aren't that efficient, which contributes to long queues and waits at peak times. For example, (and I'm sure you'll forgive my Business Operations-speak) the gua bao aren't made in a production-line, but rather with staff members making individual ones, all reaching into that central condiment trolley at once, and then having to squeeze past each other to get them to the customers. Another example: menus are only placed near the register, and not posted up anywhere - slowing things down as customers can't decide what they want until they get up to the front. (Although you know me, I'd googled the menu beforehand and already knew what I wanted! Hehe). I'm sure in time all these little kinks will be worked out, and they weren't necessarily dealbreakers for me... but I just thought it was worth mentioning in case you need to work around a short lunch break! 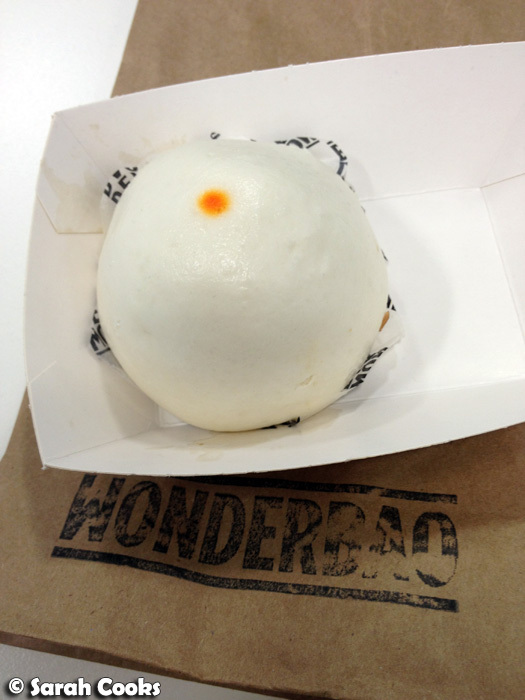 But as I'm sure you can tell, I really like Wonderbao. The baos are great, and really well priced. 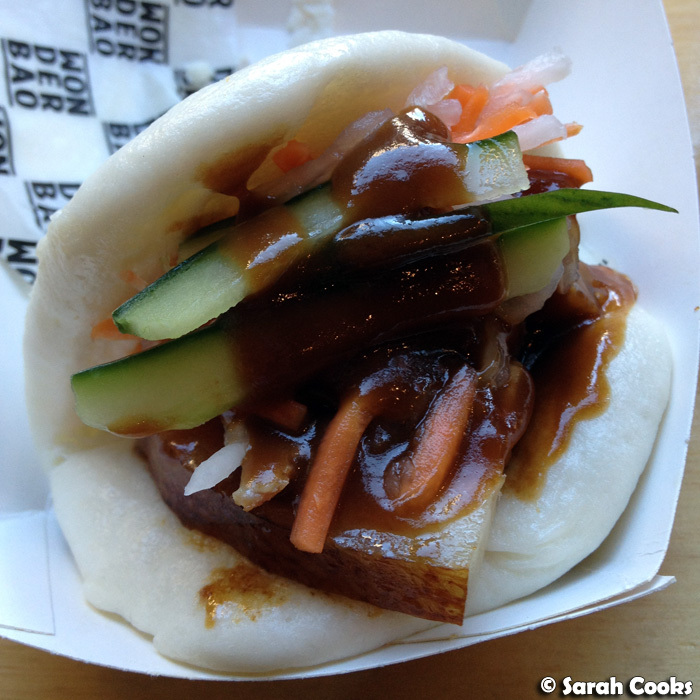 The baos range from $1.70 to $3.20, and the made-to-order gua bao are only $3.80. The individual items are all pretty big, and I find that two make a decent-sized lunch. 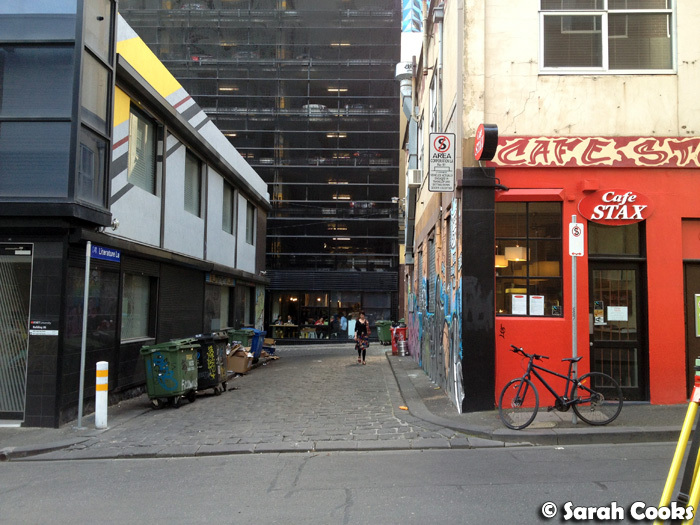 A delicious, handmade lunch in the CBD for less than $7? Yes please! Here are some little scribbles I did on a map I printed out from Google - I hope this helps those of you who have struggled to find Wonderbao! I am less than useless with directions, and it took me a lot of wandering around to find it the first time, hehehe. If I can find it, you can too. Wonderbao themselves put a map up on their Instagram feed, but it's a bit stylized, and because I'm bad with directions, I find referring to a standard Google map much easier. 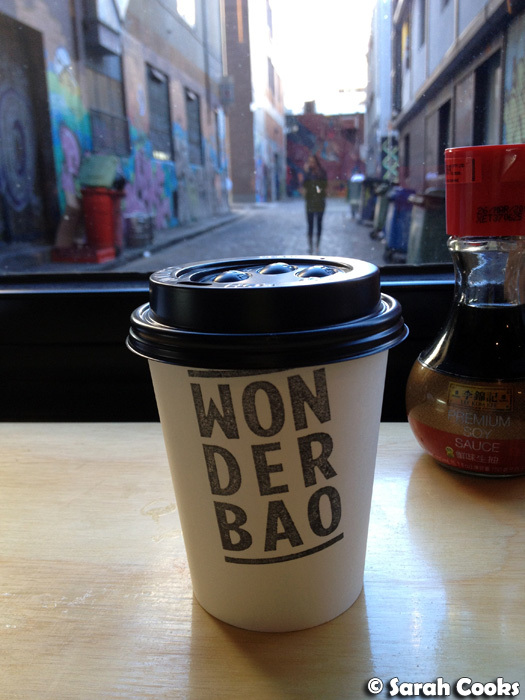 Wonderbao (the "W" in the map above) is in a little arcade with one entrance on A'Beckett Street and one on Literature Lane. If you need more direction... please check out the below photos and directions! 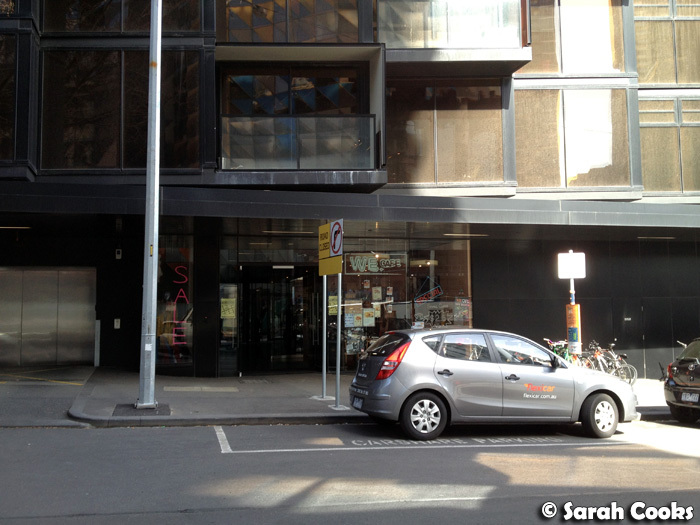 The A'Beckett Street entrance to the arcade looks like this, and you have to walk through it to get to Wonderbao. (Wonderbao is at the back). It's pretty nondescript; I walked past it the first time until I saw the little yellow "Wonderbao" signs stuck in the windows. 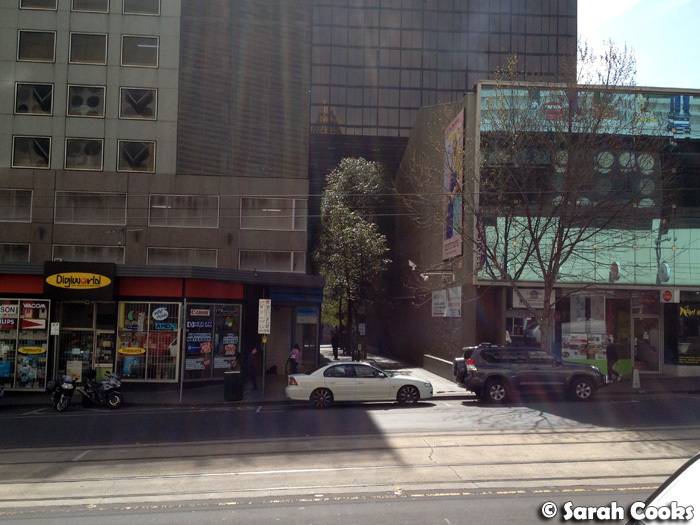 This lane is directly opposite the entrance to Melbourne Central on LaTrobe Street - just cross the street, walk straight down that lane 'til you get to the end, and you will be at Little LaTrobe Street! 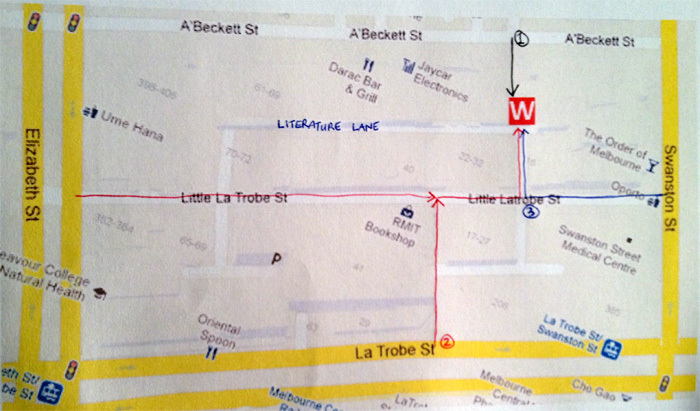 Whichever way you choose, once you get to Little LaTrobe street, you'll need to find Literature Lane. Just keep walking until you find Cafe Stax. It's bright red and Little LaTrobe street isn't that big. You'll find it. 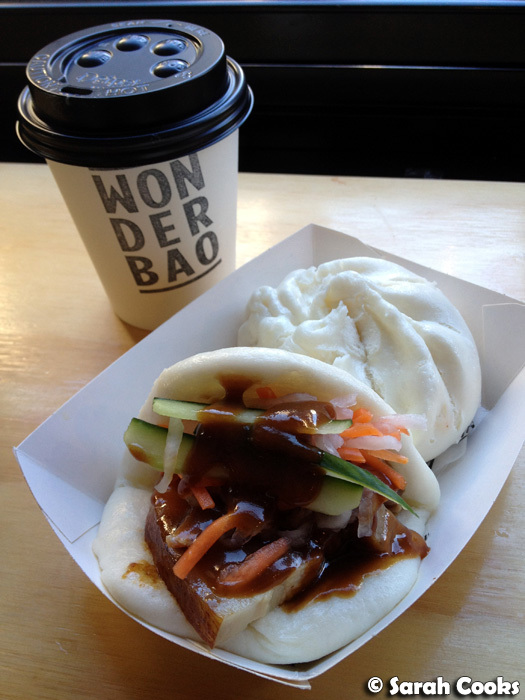 Go down the cobblestone street and you will be at Wonderbao! Hope this little set of directions helps! Forgive me if it is too basic for you, hehe, but if you're directionally-challenged like me, I'm sure you'll appreciate it! Winston - haha, I love yeo's too! Let me know what you think of wonderbao when you go, would love to hear your opinion! Lorraine - omg!! It hadnt even occurred to me to think "wonderbra", but now I can't unsee it! Lol! Ok I am there - this place sounds fabulous - love your super detailed directions as well Sarah - bet I would still get lost! 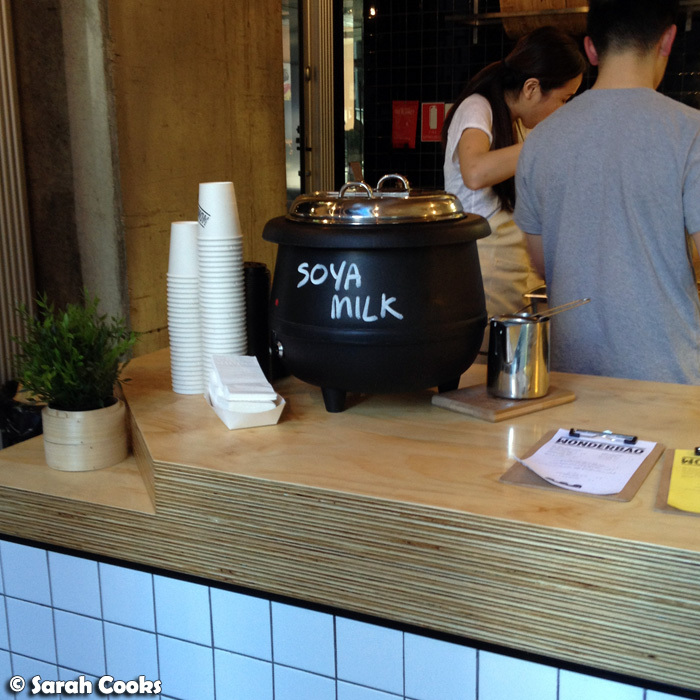 Gosh, how good is hot soy milk. Though, id it bad I also add a heap of sugar as well? Soy geeewd.